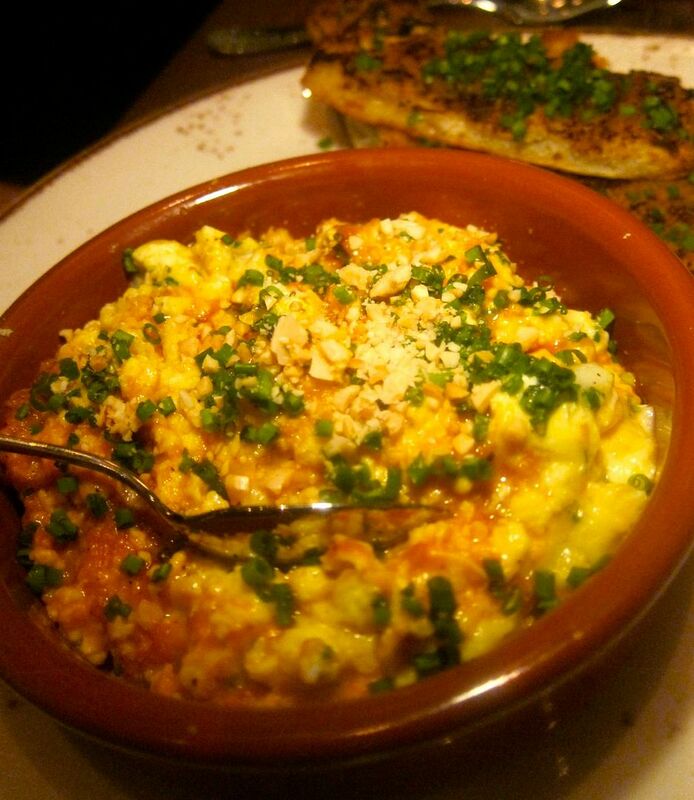 My must-have is the marvelous scrambled eggs with romesco to pile on tomatgo confit toast. I eat out with friends six nights a week, mostly in search of something good enough or bad enough to write about. When a spot arrives with great expectations unrealized, I often decide it’s too soon to judge. About then I find myself longing for a place I know I’ll be happy. If you follow my twitterings, you know where I’ve been going. If not, here’s where I’ve been eating lately when I give myself a night off. 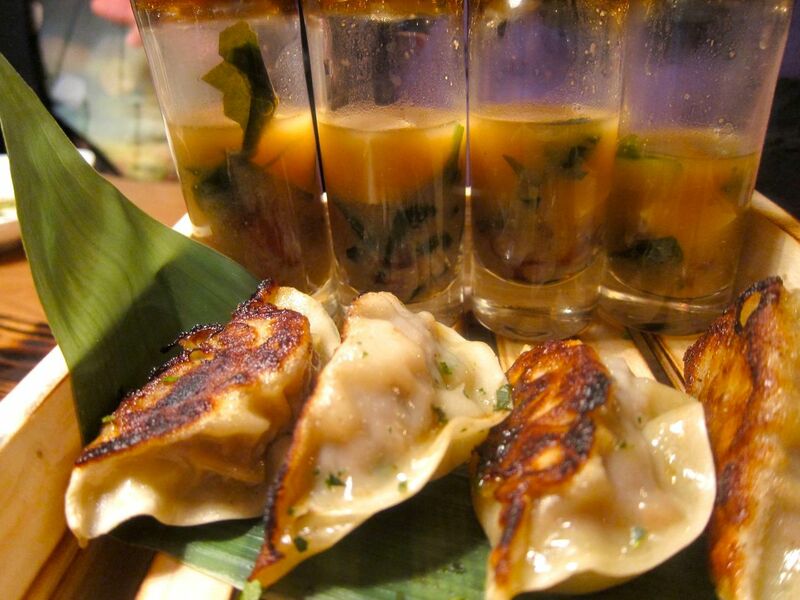 At Red Farm, I focus on Chef Joe Ng’s supernal dim sum, like the lamb dumpling shooters. 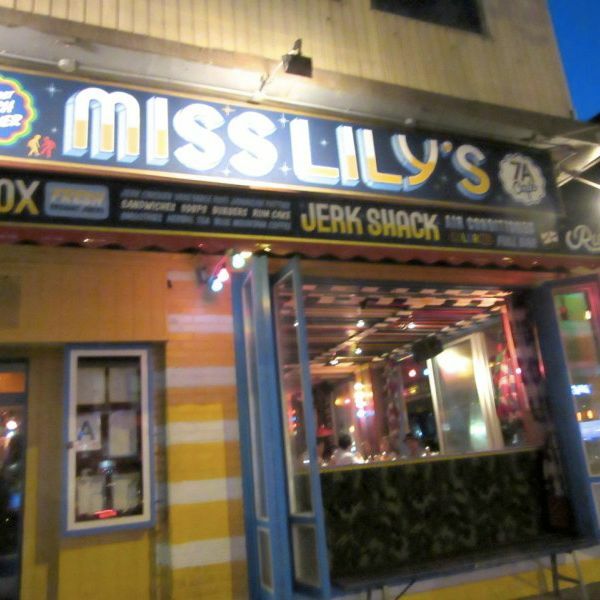 There’s a lot to be said for brilliance in a welcoming neighborhood spot you can walk to. As you might guess, I don’t usually wait long for a table at Red Farm, three minutes from my pad. As managing partner Ed Schoenfeld has confessed: “All customers are equal but some are more equal than others.” And we’ve traded barbs and cheek kisses since he was the first Caucasian captain in a Chinese restaurant at Uncle Tai’s Hunan Yuan in 1973. I invariably order the smoked salmon bruschetta on crispy fried eggplant, crunchy vegetable and peanut dumplings, crispy shrimp and snow pea leaf dumplings, the lamb shooters, and the marvelous shrimp-stuffed chicken. I might have asparagus or snow pea leaves with garlic to make my late mom, Saralee, happy. If my companion insists on dessert, I lobby for the fruit plate. 2170 Broadway between 76th and 77th Streets. 212 724 9700. Click here to read more. 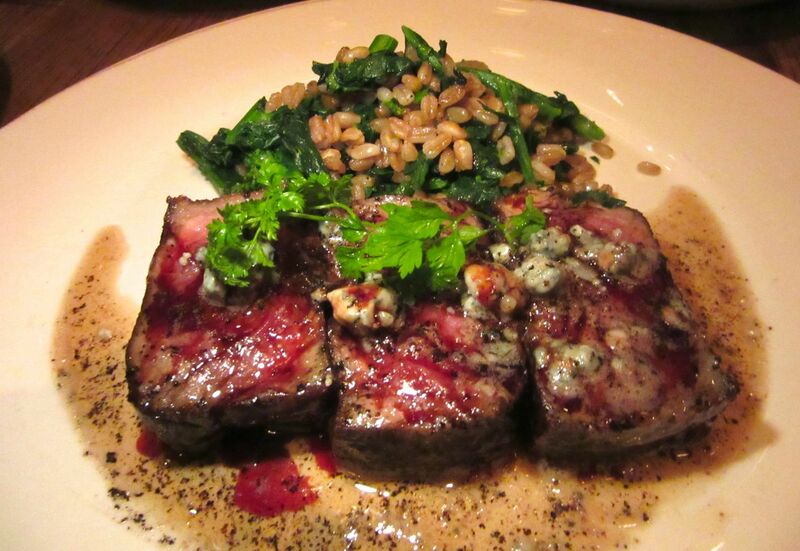 I conspire to share Gato’s beef with blue cheese after never enough bar dishes and appetizers. When a noisy, crowded spot a $30 taxi ride away becomes my must-go-again destination, you know it’s got to be great. That’s Gato. I have been back again and again, and only once did I not see Bobby Flay working on the line, not that it matters by now. I can’t ever order all my favorites, there are so many. I might have three or six bar dishes to start, always the white anchovies and the chorizo crepinette, maybe the raw tuna-stuffed piquillo or eleven layer potatoes. Once in a while, I have to have the Gato spreads with buckwheat pita -- so unlike anyone else’s cliché mashings. Or the lamb sausage pizza. My one absolute must is always scrambled eggs with romesco and bucheron cheese to pile on tomato confit toast, and, almost as often, the charred carrot with parsnip chips. Much to my surprise my favorite entrée is the charred beef with Valdeón blue cheese-brown butter, but I like the chicken with crispy potatoes too. The tarte tatin with whatever fruit is in season is my dessert. 324 Lafayette just a few feet north of Houston. 212 334 6400. Click here to read the full review. 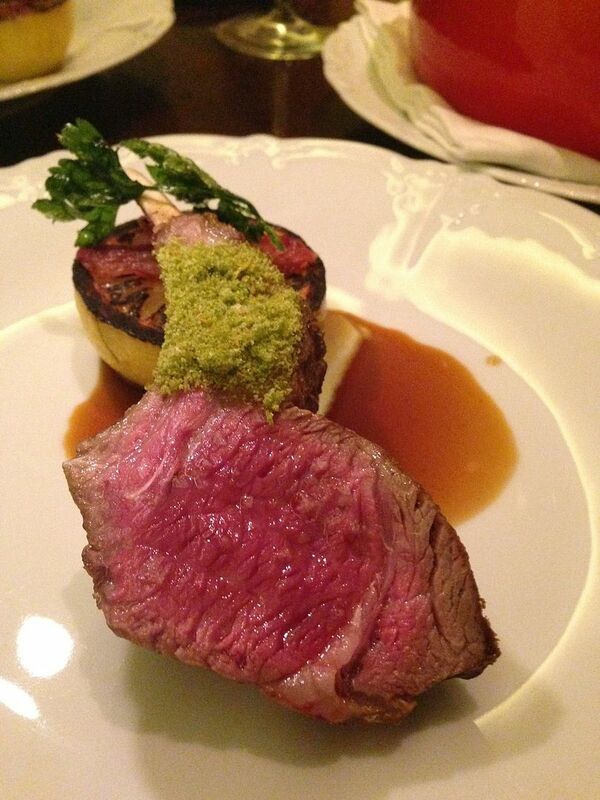 Chef Markus Glocker found his mojo at Bâtard with the sensational lamb for two. 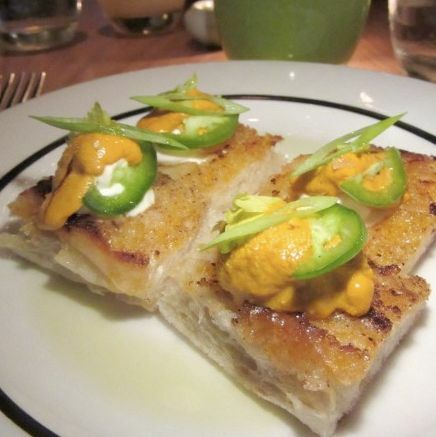 I’m game to try whatever special Chef Markus Glocker has channeled from his Austrian mom’s repertoire or the three-star kitchens he haunted before partnering with Drew Nieporent at Bâtard. On first tasting, I thought I would never be able to resist the lamb-for-two-in-two-parts. And, of course the Époisse cheese finale. Then I tasted the wiener schnitzel (poussin schnitzel, actually) with potato salad, remarkable because in his obsessive perfectionism the chef makes it twice a day. so it doesn’t need to be refrigerated. That was before I discovered the thick turbot steak with a poached egg yolk inside. I haven’t been wild about desserts, but when Bâtard got three stars from the Times and the world arrived, packing in too tightly, the chef promised to hire a pastry hand. I feel a desperate need to go back soon. 239 West Broadway between White and Walker Streets. 212 219 2777. Click here to read my review. 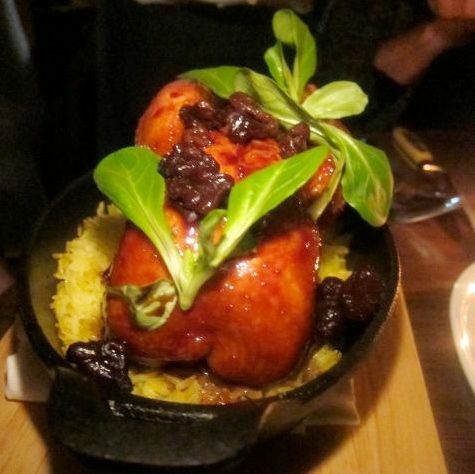 Bustan shows off the Israeli taste of Middle Eastern cooking in its blue oven. 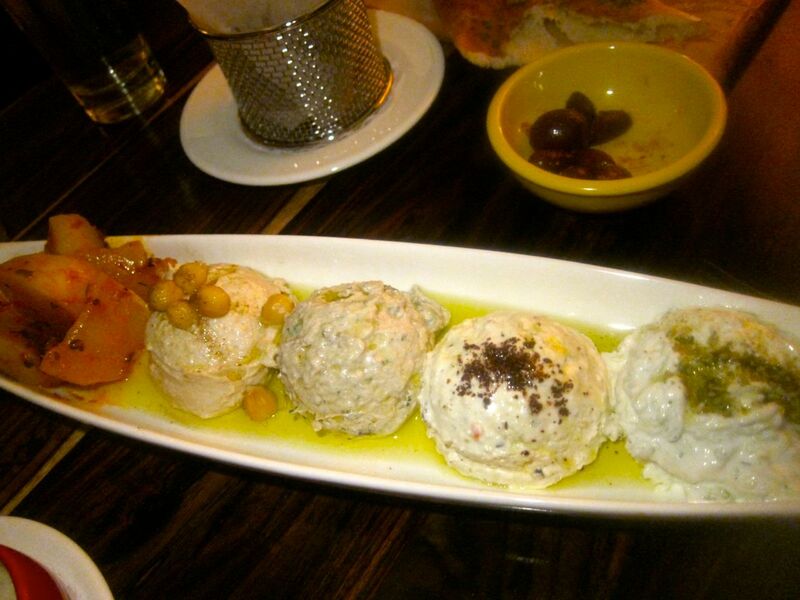 I wasn’t the only Upper West Sider to fall passionately for Bustan that week it opened, overloading on the splendid taboon-baked pita with classic Middle Eastern spreads -- it seems they are called “mazettim” in Israeli. Once we even added the smoked salmon pastrami pizza, as well as the rich beet salad tossed with not too much of the dreaded kale, pomegranate, and shaved fennel and topped with grilled halloumi cheese. We watched a waiter delivering something under a ballooning bread crust to the next table, and wanted that too -- lamb kebabs, it seems. But in three visits my pals and I had already eaten too much -- the falafel basket with pickled mango tahini, spicy feta spread -- to even consider it. I made friends with one of the floor walkers so I hope to snare a spot next time I call. 487 Amsterdam Avenue between 83rd and 84th Street. 212 595 5050. Click here to read more. 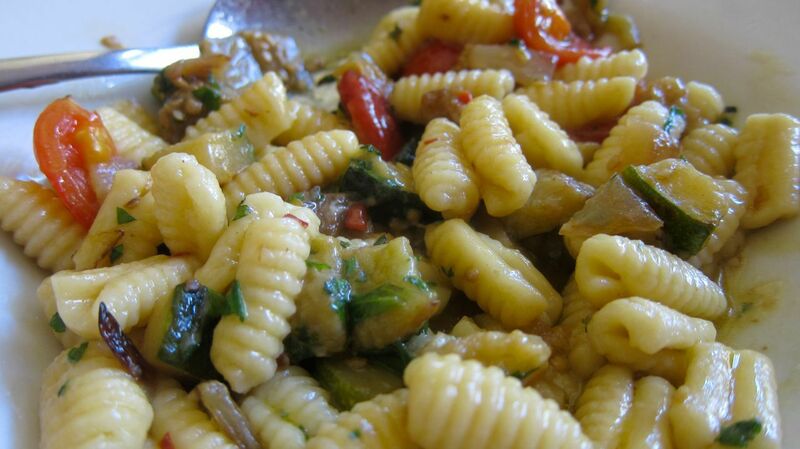 Heaven would be pasta as good as Arco’s Café’s gnocchetti Sardi alla crudaiola on every NYC block. When I yearn for a relaxed no-need-to-think-and-judge evening and it’s pasta I want, maybe even inexpensive pasta to take friends and no chi-chi fuss, I think of Arco Café. It’s a zip uptown to 103rd Street for me, but not far crosstown for you either, if you happen to live on the Upper East Side near the Park. It’s small and smart-looking with a wall of glass and a sidewalk café and the dedicated Francesca racing around. Last time I took my neighbors, we shared the toasted crisps of pane guttiau smeared with olive oil and ordered baby octopus. I let them choose that, though I find the intense sauce a bit murky. Then I insisted on lining up four pastas for the three of us – the special spinach green cavatelli with shrimp and pancetta, traditional “Malloreddos Campidanese” with sausage in a spicy tomato sauce, “Gnocchetti Sardi alla Crudaiola” tossed with mixed vegetables in garlic oil, and potato gnocchi montanara with mushrooms and bacon in a luscious cream glaze. Of course it was too much. But we ordered olive oil cake and the semifreddo anyway. 886 Amsterdam Avenue between 103rd and 104th Street. 212 665 0033. Click here to read more. 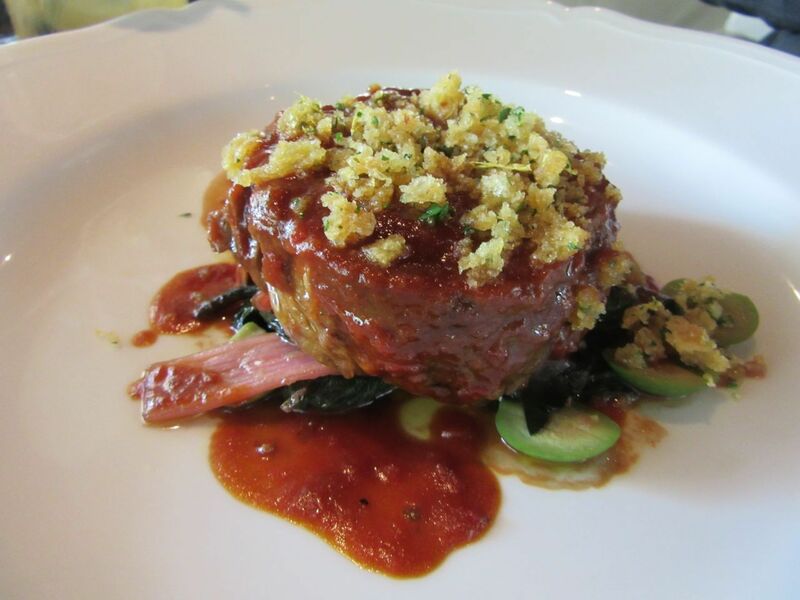 I discovered chef Jonathan Benno’s voluptuous lamb shoulder on Lincoln’s Restaurant Week menu. Any excuse is a good reason to go to Lincoln Ristorante for me. I try to schedule any business lunch there. I especially like sitting in the southern corner overlooking the stairs from 65th Street, but I also love the view of the reflecting pool from the center tables opposite the kitchen. I do dinner at 6 or 6:15 before a movie or theater at Lincoln Center too. Lincoln can be expensive. I love it when someone else is paying. But they often have prix fixe specials. Recently, the lamb shoulder on the Restaurant Week lunch was so seductive, it enticed me to eat meat in the middle of a writing day. 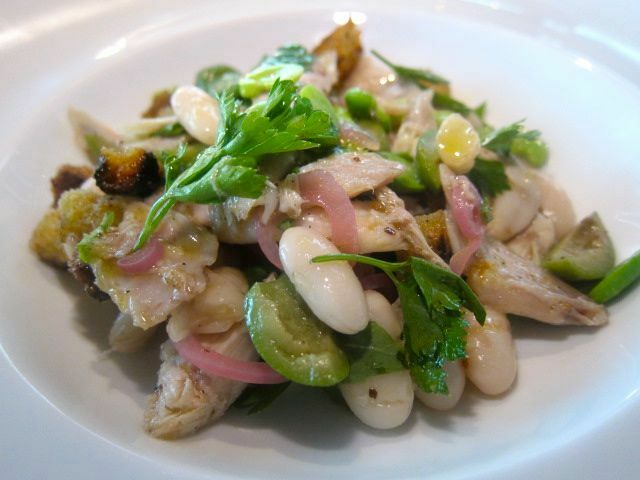 Before the theater at Lincoln, I’ll choose a salad to start, like this luscious rabbit toss. At night when I’m usually paying, I don’t want to eat too much before any intellectual exercise anyway. I choose a salad followed by chef Jonathan Benno’s elegant eggplant Parmesan, a $16 side. When they pass the bread, I try to resist, taking the cheesy thin bread sticks. “That’s cheesy as in laced with cheese.” I might share sorbets for dessert and I bring the complimentary caramels home for my trainer. Better to support her dentist than mine. 142 West 65th Street between Amsterdam and Broadway. 212 359 6500. Read more by clicking here. Since my friend, the über Neapolitan Francesco, introduced me to Rafele, his favorite Neapolitan eating house, I’ve been three times to review it and back again and again to introduce friends to Chef Raffaele Ronca’s winning ways with vegetables. His giveaway eggplant caponata with two kinds of bread may be the best caponata ever. I like the crispy tendrils of artichoke, the Sicilian cauliflower his mother’s way, his small crumbed arancini and the grilled fennel. I like to share the pizza Rafele -- if I’m with a vegetarian, I get it half with prosciutto, half without. I look for a repeat of one evening’s special spinach-tinted ravioli filled with chestnut and buffalo ricotta. I also crave the paccheri pasta with octopus, Marzano tomatoes and some beans Raffaele added just for Francesco and me. I’m not a big fan of Italian cheesecake but the chef’s feather-light version is worth sharing. I ask to sit at the table facing the kitchen action. 29 Seventh Avenue between Morton and Bedford Streets. 212 242 1999. Click here for more ideas on what to order. Depending on the season, the “Verdure” starter evolves, but always there will be pine nuts and raisins. 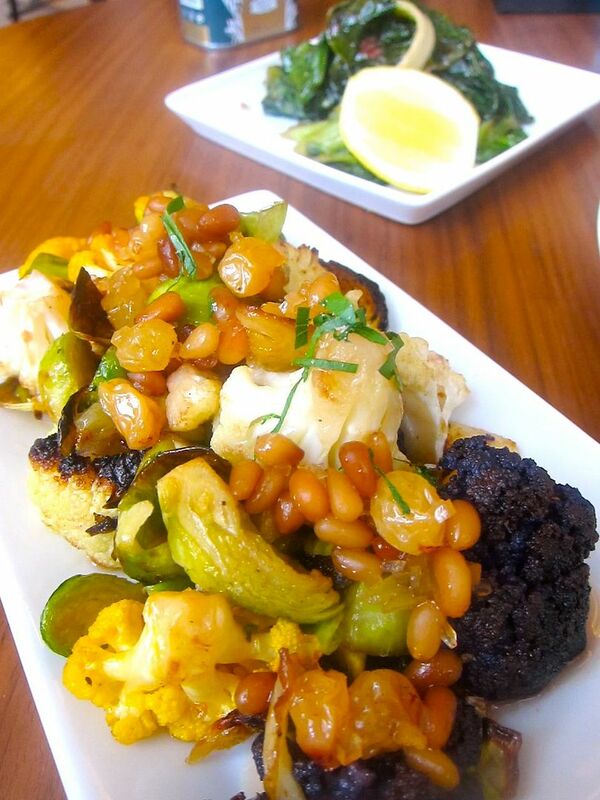 Of course, it won’t be news to regular readers that I’m hooked on Stella Trattoria 34 at Macy’s (an advertiser) where I invariably order the wood-oven roasted cauliflower and Brussels sprouts “verdure” with pine nuts and golden raisins. And where I almost always choose the ridged tortiglioni -- rigatoni-like whole wheat tubes -- with whatever the chef is tossing in that evening. For a while it was peas and ham. Later it was veal sweetbreads, potato and smoked bacon -- and always with lush fontina cream. Entrance to dedicated elevators at 35th and Seventh Avenue. 212 957 9251. For more ideas on what to order, click here. 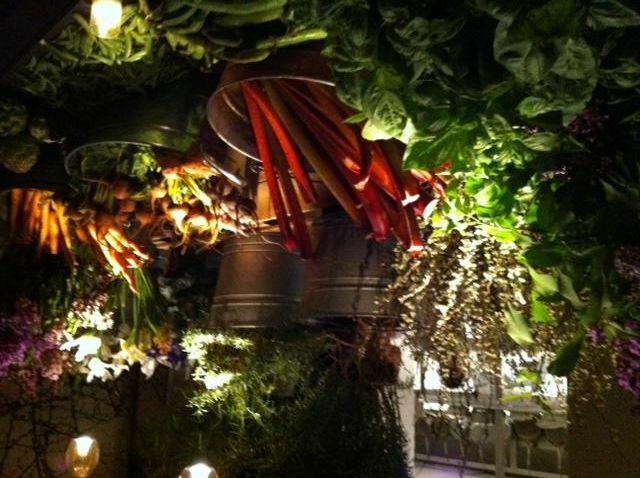 The romance of seasonal Greenmarket eating starts at ABC Kitchen’s display. Here it is in May. I never stay away long from ABC Kitchen either. It’s always thrilling to mark the season with whatever Jean-Georges and his kitchen have found for inspiration in the nearby Greenmarket. I remember one early fall evening when the menu featured seven or eight squash varieties in surprising ways, including spaghetti squash with spaghetti. The salted caramel ice cream sundae with peanuts and popcorn in a puddle of dark chocolate is a certain ending, although the house often sends along something seasonal as a gift. 35 East 18th Street between Broadway and Park Avenue South. 212 475 5829. Want to read more? Click here. Friends at Salumeria Rosi for the first time want salumi. I taste too, reminded how good it is. My most likely spot for lunch remains Salumeria Rosi, just steps from my office. The house always sends out the spritzer they know I love. Like a puppet with no will, I drink it even though I never drink at lunch. I almost always start with the seasonal greens under Parmesan shards and the leek tart, letting my guests order the salumi collection if they are first-timers. Then I offer to share the pasta Amatriciana. That always makes me think of my guy Steven who loved it. It’s my favorite too although I sometimes alternate with Cesare Casella’s uniquely-spiced lasagna. 283 Amsterdam Avenue between 73rd Street and Jacques Torres. 212 877 4801. A cup of Jacque’s ice cream or a big, hot melting chocolate chip cookie makes a perfect dessert. 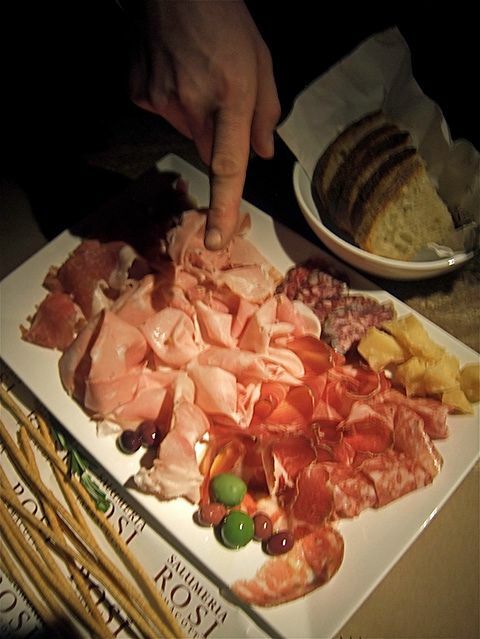 Click here to learn more about Salumeria.